Tilo is a trailing or climbing perennial herb native to tropical regions of South America and the Caribbean. Tilo is cultivated for it's foliage, which are often brewed as a relaxing tea and general medicinal tonic in South America and Cuba. 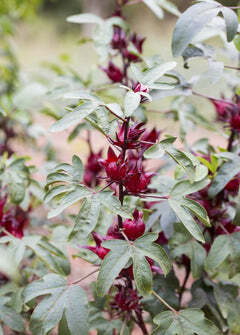 Tilo's dark green leaves and stems contain Coumarin, an anticoagulant. Violet-colored flowers are tiny and delicate and have a light vanilla fragrance. Tilo is also commonly known as Water Willow. It thrives in moist soil conditions in partial to deep shade. It makes a very beautiful groundcover.